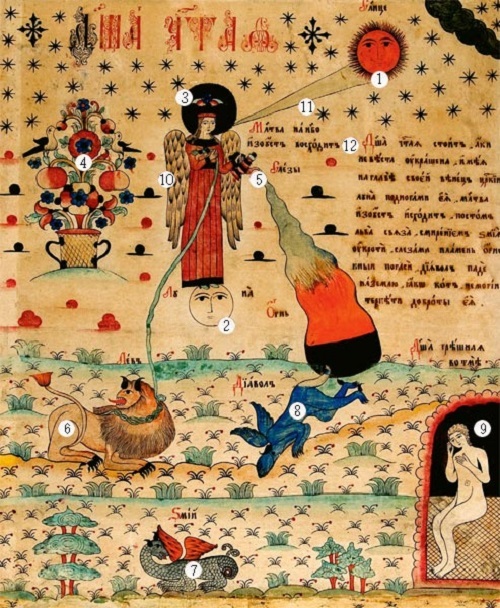 Often found in the spiritual literature of XVII-XVIII centuries, the plot of “Pure Soul” goes back to the “Parable of the soul of the righteous”. In the parable of the Immaculate Virgin (on this subject even painted icons) – a symbol of purity and righteousness. 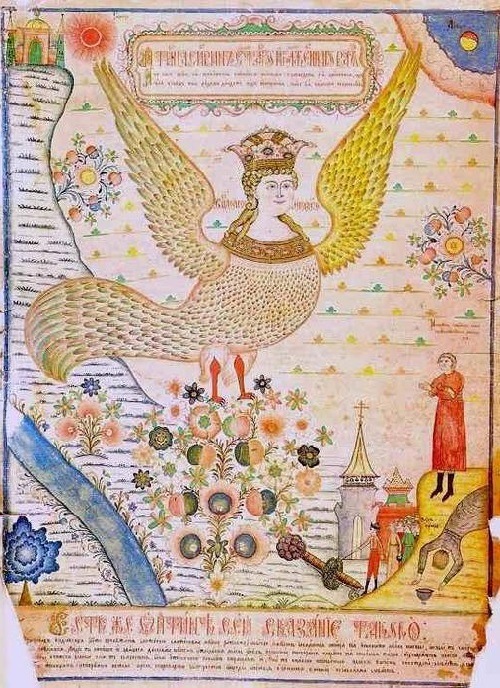 “Decorated” with all the virtues,” she stands above the sun and the moon under Her feet.” Dragon, sun, moon, stars, eagle wings behind the back – everything sends the viewer right to Revelation (“And there appeared a great wonder in heaven: a woman clothed with the sun, moon under her feet, and upon her head a crown of twelve stars … And the woman was given two wings of a great eagle, that she might fly into the wilderness, into her place on the face of the serpent, and where she is nourished for a time, times and half a time “(Rev., XII). Although there are various interpretations of the image of wife, but the two most common – the Church and Mother of God. 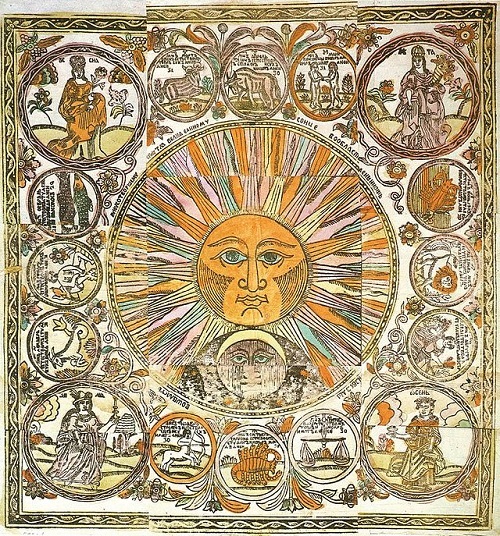 Despite a direct connection of the plot of lubok with Revelation, that is, with the Apocalypse, the picture gives the impression of something bright and cheerful. One can see the artist fully responded to Old Believers ideal of iconographer – to paint icons can only holy men. Presented image was created in the first half of the XIX century by an unknown artist of Pomorian school. Art historian and the largest collector of Russian folk Dmitry Rovinskii believed that the plot of “pure soul”, popular with folk artists, apparently follows the monumental paintings of temples and royal chambers. Among them wooden Kolomna palace of the eighteenth century, early XVII century fresco depicting the “Pure Soul” can be seen in the surviving fragments of painted porch of Trinity Cathedral of Ipatiev Monastery (Kostroma). Also known engraving of the same subject, illustrating the Kiev Akathist in 1629. Drawing splint appeared at the Old Believers in the middle of the eighteenth century. Unlike print the whole thing was done manually. Drawn splints were created in several centers of Old Believers: Vologda and Olonets provinces, on the Northern Dvina, Pechora, in the suburbs (Guslitsa) and Moscow. 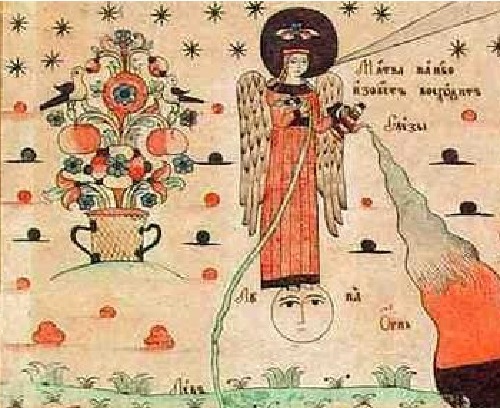 Old Believers depicted their monasteries, portraits of the leaders of the Old Believers, Bible stories, illustrations to sayings and parables of teachers, hagiographic collections (Paterik, Prologue), birds of paradise Sirin and Alkonost, calendars, religious poems and songs. On the front and on the back sometimes made inscriptions, dedications, even put a price (“dime, osmigrivennik”), rarely the artist’s name, date of creation. 1 The sun symbolizes the light of Christ – “the sun of righteousness,” his truth and virtue. 2 The Moon in the Christian culture and iconography symbolizes the Virgin, as well as the Sun – the Son of Man. In the “Commentary on the Apocalypse” of St. Andrew, Archbishop of Caesarea (VI- VII century), the Moon – a way of the sacrament of baptism, “the moonlight means the faith of the cleanished and released from corruption.” Sometimes it is understood as a symbol of wisdom. 3 Nimbus here replaces a crown of stars (in splints, they are scattered across the sky), which is normally present above the head of the Soul. It is a symbol of the apostolic dogmas. 4 Blooming tree with fruits and birds – so splints portrayed the world tree. This is a multi-faceted character: it can mean fertility and life (and, hence, the Mother of God, who gives life). Four selected element can be understood as the time (morning, afternoon, evening, night – spring, summer, autumn, winter) and space (east, south, west, north). On splints instead of wood often appears bouquet that Soul keeps in her hand. 5 From the pitcher soul sheds tears that extinguish the flame of sinful passions (“the corruption of sin”). 6 Leo, which soul keeps on a leash – the image of passion and anger, tamed with lent. 7 Serpent-like dragon (of the Apocalypse) – a symbol of evil and temptation – tamed by virgin humility. Like a lion, it became quite tame. 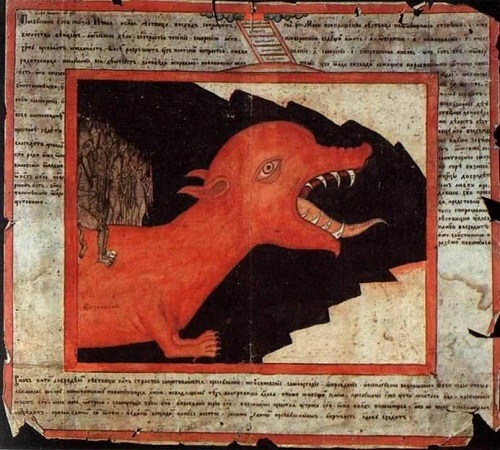 8 Demon with cat’s tail, which Soul has won with its patience: “could not tolerate Her kindness.” Puss in different cultures – the personification of evil: German word “heretic” is derived from the word “cat” in Russian cat – a witch. 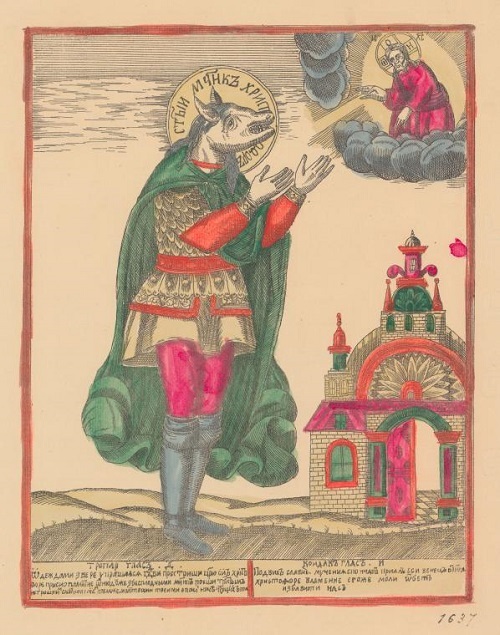 It is believed that under the guise of a cat artist portrayed Peter I, that is, the Antichrist in the representation of the Old Believers. 9 Sinful soul, naked, wingless, but very cute (as well as all the negative characters on the page) languishing in the dungeon. 10 Wings – in this case, a sign that the soul is as pure as an angel. 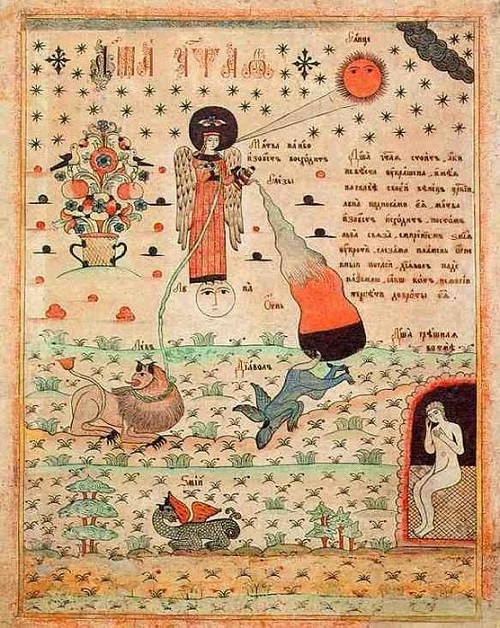 11 “Bubble”, as in the comics coming from the mouth of the Soul – an appeal to the Sun, that is to Christ (“From her lips to God prayer goes, this balmy incense”).